Everyone has their secret shame, right? I’m not talking about those photos from the 80’s or the fact that you like Kenny Loggins. I mean a food secret shame. For some, it’s Spam sushi – or Spam anything, for that matter. For others, it might be that late night (or early morning) 4 am run through the Krispy Kreme drive through. Then there is that lot of you that puts mayo/ketchup/mustard on everything. Weirdos. My secret food shame for a long time was Brussels sprouts. I had them as a kid every so often growing up but they were always, umm, the frozen kind. I, like everyone else in their right mind who has had a frozen Brussels sprout, had been scarred just a little by that experience. As a teenager, though, I started getting into food and had them roasted in a very nice restaurant. Cabbagey but not – not to mention how cute they were – and caramelized and sweet from the roasting. I was hooked and have eaten them ever since. The problem is that many people think they don’t like Brussels sprouts but haven’t had them prepared in a modern and loving way…so when I say love Brussels sprouts, it’s often met with an "Eeew." 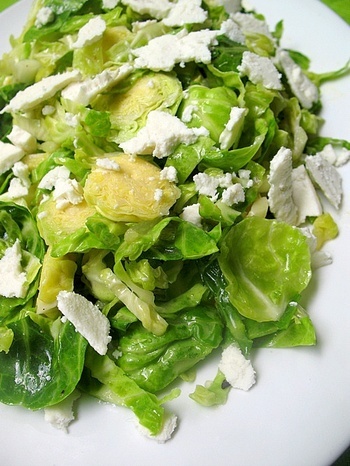 This recipe will change your mind about Brussels sprouts, I promise. If you already like them, you’ll love this. I wish I could tell you this recipe is more complicated than it is…but I whipped this together in about 10 minutes. Rustically cut, chiffonade the leaves or use a mandoline to shred the sprouts – I think it looks better and more rustic if some of the leaves are chunky or left whole. A quick thing I did before putting the salad together was to pour semi-hot water over the shreds, leave for a minute, then drain off. Immediately after, I rinsed them with cold water to make sure they didn’t wilt too much. That minute in the warm water softens them just a bit without boiling or steaming them & risking getting mushy. The creamy Ricotta Salata makes this salad with a creamy, salty counterpoint to the veggies. If it’s not readily available where you are, good quality feta will work, as well. This dish is just screaming to be paired with a piece of grilled salmon. – In a medium mixing bowl, whisk together the mustard, olive oil, and lemon juice. Taste before you season with sea salt and fresh ground black pepper. When seasoned to desired taste, toss in well-drained Brussels sprouts. Toss thoroughly to coat with the dressing. Plate salad and top with crumbled ricotta salata (or feta) or lay slices on top if you’re doing it that way. Served immediately. I love brussel sprouts! And, have always wanted to try ricotta salata. Where did you find it here? Yum! Great salad idea! Wrong season for me…I won’t see another Brussels Sprout until November. Sounds delicious! I look forward to making & tasting it! I’ve never eaten anything like this and love, love, love the sound of it. I have to say, though, that you’re a pretty huge dork for having Brussels sprouts as your same food . . . I mean, they’re healthy for you . . . where’s the shame in that? How about nasty-a$$ boxed mac-n-cheeze . . . now there’s a shame-worthy food crush! But back to this recipe. Thanks for the blanching tip. As I was reading the post, I was thinking to myself: “Hmmmmmm. I wonder if these things are any good absolutely raw.” Then I come upon the blanching tip. Brilliant! Yep, I’m totally still in love with you! I can’t believe there are more than one way to make brussel sprouts taste good!!! i love them irregardless!